Play2Win Bingo Review | Get Your £30 FREE Bingo Money Here! 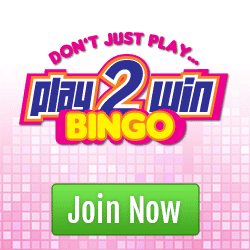 Play2win Bingo is the perfect name for a bingo site because that’s exactly what it’s all about. If you want to play bingo for the chance to win spectacular prizes then this is the place to come. There’s a rather large selection of games on offer which is typical of any site managed by the Live Bingo Network so you’ll certainly have plenty of chances to bag yourself a prize. However, the site has a lot more to offer than just a great range of games and our review will cover it all. The welcome offer alone is enough to entice anyone to play here. Before you even add any money to your account there’s a no deposit bonus entitling you to 7 days of free bingo games. This is perfect for testing out the site without risking any of your own cash. Once you’ve used that free cash up there’s a massive 300% bonus on your first deposit which will help you get started. After that, you’ll get a 150% bonus on your second deposit and a 100% bonus on your third deposit. 7 days of no deposit free bingo. 550% in bonus cash across your first three deposits. Play for £6000 in sliding jackpots every evening. Buy one, get one free offers every day. Play2winbingo.com doesn’t have a dedicated mobile bingo app but if you’re the type of player who likes to play on the go you don’t need to be concerned because the site is mobile optimised. The great thing about this site is that you can use the same login details across multiple devices and even if you register via your tablet or smartphone you’ll still be entitled to the 7 days of free bingo games and 300% first deposit bonus. If you like a bit of variety then the games lobby at Play2win Bingo is right up your street. To start off with there are four types of bingo on offer including your classic 90 ball bingo as well as 75 ball, 80 ball and 30 ball variations. Whether you’re a penny pincher or a high-roller you’re guaranteed to find a ticket price to suit your needs as they range from 1p right up to 25p. The majority of the games are pre-buy so they will payout even if you’re not logged in which is perfect for players with a busy schedule. When you’re done with bingo there are plenty of other games to stick around for. Why don’t you spin the reels of your favourite slot game? They are in alphabetical order so you won’t have any issue trying to find what you’re looking for. What we also like about the games lobby is that the slot games have all been rated out of five stars and players have voted for their favourite. The most popular games on the site seem to be Starburst, Gonzos Quest and Twin Spin which would make a great place to start. Play2win Bingo is one of the few bingo sites that offer free demos of some of their slot games. Unfortunately, the selection is quite limited and you can’t win any cash from these games – they’re purely for fun. As well as slots there’s a fantastic selection of casino games and instant games for you to try your luck on. 1 week of no deposit free bingo games. Bonus cash on your first three deposits. Doesn’t have a mobile bingo app. Doesn’t have any exclusive bingo rooms. You can transfer funds with your credit or debit card as well as Skrill, Neteller and Paysafecard. Customer support team is available 24 hours a day, seven days a week. Support telephone number: 02036 081305. Play2win is a brilliant bingo site that gives you the ability to play free bingo for a week with no deposit required. This means you can check out the site without having to spend a penny. Once you have sampled the games, you will most definitely want to grab the 300% bonus that awaits you and see if you can scoop one of those giant jackpot prizes you have always wished for!